Online Registration for 2016 Conference is OPEN! Secure online registration for the 8th Family Conference and Scientific Symposium in Plymouth MA (May 12 – 16, 2016) is now OPEN! Register you and your family today! 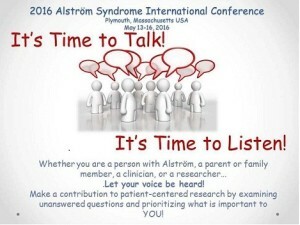 Alstrom Research Connect launches today!! At last, the Alstrom Research Connect and Family Exchange has launched! Find out more about this patient-centered registry that will enable researchers as well as other families to learn more about the syndrome as they work towards a cure. You control your information! YOU can drive research forward! Sign up today! !